Education is the basic human right recognized by all the democratic nations. It is specially in the light of the basic right of education that child labor has been declared a crime, simply for the reason that the children below the age of 14 years (in most countries) should only be sent to school for education apart from being given all rights and freedom to enjoy their childhood instead of being used for other purposes which disturb them socially mentally, physically or morally. In many countries basic or primary education has been declared to be provided free of cost at government run schools while in some of the developed countries there are even higher levels of education offered completely free of cost. Whereas, education is available free in some of the developing and the developed countries, it is a big financial burden for the residents of the other countries, thereby restricting those potential students from their basic right of education who cannot afford to pay such huge sums. It may be that the governments of such countries could not be financially strong to support these kind of projects, but it is pertinent to mention that gaining education has no limits and bounds, and no hurdles can resist the aim of gaining education unless one is committed. This will be clarified in the lines ahead. And the availability of educational institutions in the proximity where one lives. If there is will, there is way.. But if one realizes the importance of continuing education, he surely finds a way to achieve his goal and in the 21st century now, the non-availability of educational institutions in the area where one lives, abnormal socio-political circumstances and even weak financial position of the family are not so much big hurdles when the doors of education are open through the variety of distance learning programs available. Learning has not remained a problem especially due to the advancements of information technology, utilizing which we can get Virtual Education at our pace, convenience, timing and cost. As most of us know that the developments in the field of computer and internet have made it possible for us to remain connected virtually with any part of the universe, yet being physically dispersed through unknown distances. Realizing the importance of education as a basic human right, many of the world renowned universities have joined hands together and incorporated platforms from where anybody in any part of the world can access courses of his/her choice completely free by utilizing the innovations of information technology era. Yes I am talking about the online availability of free courses and certification programs, which are to a great extent serving the humanity. 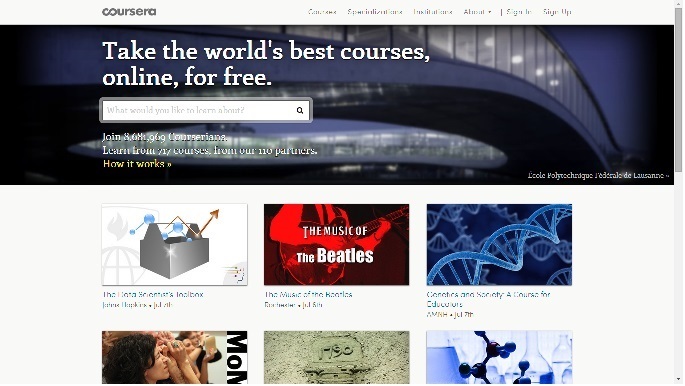 There are many forums now which offer completely free courses online, they usually have lecture videos along with online text-books, quizzes and assignments, peer evaluations, pre-lecture assessments and final exams etc. It is obvious that an active student watching all the lectures and going through all of these practice / performance evaluation sessions will develop ample knowledge of the subject. Furthermore, the students passing a minimum set requirement (like attaining a particular grade) are given certificates and that too at absolutely no cost. These courses are useful for both the new students who already have no idea of the subject to be studied and the students who have already gone through such courses at other platforms like during the study of their degree programs, and want to improve the skills in the subject. These certificates are issued both in the electronic as well as printed form depending upon the forum from which you are doing your course. And for sure, they are of great value to improve your skills and make yourself eligible for better employment opportunities. Following are the places where you can find, join and get certified in the courses of your interest. These will surely help you improve your knowledge and skills of the subject. A blog where I discuss about Technology, Blogging, Making Money, Smartphones, Islam and the like stuff.